1. Preheat oven to 425°F. Mix oil, paprika, rosemary, sea salt, pepper and garlic powder in large bowl. 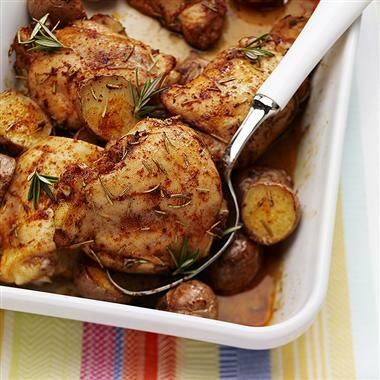 Add chicken and potatoes; toss to coat well. Arrange potatoes in single layer on foil-lined 15x10x1-inch baking pan sprayed with no stick cooking spray.